Se terminó la espera, lanzamiento oficial de DotA Allstars 6.68…. Fecha: 28 de Julio de 2010. *DotA 6.68 solo soporta las versiones 1.24b (1.24.1.6374), 1.24c (1.24.2.6378), 1.24d, 1.24e de WarCraft III ó superiores. Fecha: 28 de Jukio de 2010. 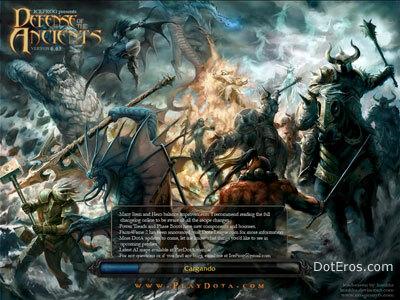 *DotA 6.68 solo soporta las versiones 1.24b (1.24.1.6374), 1.24c (1.24.2.6378), 1.24d, 1.24e ó superiores de WarCraft III. NOTA: El mapa DotA Allstars 6.68 es la última versión oficial a la fecha. You have two sub abilities. One to move them outwards and one to call them back in. You can stop them at any distance by toggling the ability order. Io temporarily relocates himself, along with any tethered hero, to the target location for 12 seconds. Thrall forces the target back to it’s previous position through a psionic rift. Sends the unit to where it was 4 seconds ago. Note: The glimpse effect has some travel time, the target isn’t instantly moved back. Eredar banishes the target to a dimensional pocket for 2.5 seconds, removing it from play for the duration. Upon return two images of the target are created under Eredar’s control which last for 6 seconds. Ererdar lays a curse on an area; one random enemy unit in the area is afflicted with the curse, causing it to take increased damage for 12 seconds. – Moonlight Shadow’s duration rescaled from 7/9/11 to 11. [spoiler name=”Ver los cambios”] Increases striking speed from 0.85/0.75/0.60 to 0.7/0.6/0.5 and can target structures. Does not reduce structure’s armor. [spoiler name=”Ver los cambios”] Can target trees to pick them up as weapons (same as Stone Giant from ladder). Makes your attack range longer, gives you bonus damage against buildings and 50% splash in a 300 aoe for 3 attacks. Adds an extra level of upgrade to your toss damage that your ultimate normally does. [spoiler name=”Ver los cambios”] With Aghanim’s Warlock calls down two golems. HP, Attack and Bounty of each is halved to be roughly the same total as before. Deals twice the impact damage and lands 0.3 seconds apart. [spoiler name=”Ver los cambios”] This item replaces Arcane Ring. – Adds a poison effect to your attacks. Deals 3dps and lasts 3 seconds. 4% slow for ranged, 12% slow for melee. – Orb of Venom added as a component. Final bonuses are the same as before. * Se ha añadido Una nueva mecanica de oro en el Juego. [spoiler name=”Ver los cambios”] “Reliable Gold” – Any bounty you get from hero kills or from the extra “aoe kill gold” bonus (feature from few patches ago) is added to your Reliable Gold pool. “Unreliable Gold” – It is everything else (creep kills, neutrals, etc). An example: You have 910 total gold (500 Unreliable, 410 Reliable). If you buy Boots of Speed, you’ll have 410 total gold left (0 Unreliable, 410 Reliable). However, if you bought Chainmail, you would have 360 Reliable Gold left. The process is seamless to the user, you won’t have to do anything extra to make it work. Your total gold is still displayed in the same place. Your Reliable Gold is displayed in your scoreboard title. [spoiler name=”Ver los cambios”] Instead of 4 bans and then 5 picks, now it is 3 bans and then 3 picks followed by 2 bans and 2 picks. 60 seconds of extra time is provided in each team’s time bank. 90 seconds of extra time is provided in each team’s time bank. [spoiler name=”Ver los cambios”] I had mentioned a Phoenix hero was in the works in the past. I’ve decided to save the hero for another update instead of putting him in this one. I want to work on him more. Thanks to all the beta testers, translators and players that provided feedback. Send me an email and let me know what you’d like to see in 6.69 and beyond.